Japan’s engagement with the Middle East is shaped by its security alliance with the U.S. and its business, energy, and diplomatic ties with the Arab countries and Israel. Over the years, Japanese policymakers have crafted their country’s policies toward the region in a way that seeks to harmonize these interests. Since the end of the Cold War, Japan has sought to play a more proactive diplomatic role in international affairs. The adoption of this “new vocation” as a “global civilian power” reflected Japan’s emergence as a major economic power, heightened awareness among the Japanese people about foreign affairs, and growing demands by the United States. Over the past three decades, the range of Japan’s activities in pursuit of international peace and security has expanded beyond financial and in-kind contributions to anti-piracy, post-conflict reconstruction, UN-sanctioned peacekeeping, humanitarian, and disaster relief operations. The key of national security is to create a stable and predictable international environment, and prevent the emergence of threats. It is thus necessary for Japan to realize an international order and security environment that are desirable for Japan, by playing an even more proactive role in achieving peace, stability and prosperity of the international community as a “Proactive Contributor to Peace” based on the principle of international cooperation. The Japanese government is keenly aware of the importance of its cultivating an image and reputation in the region as a positive, constructive external actor. Accordingly, Japan has sought to contribute to the pursuit of peace, particularly with respect to the Israeli-Palestinian conflict. Yet, this has proven challenging, both because of the intractability of the conflict and because of the difficulty of ensuring that its actions are perceived as helpful rather than harmful by Israelis, Palestinians, and the surrounding Arab states alike. The long-standing official position of the Japanese government regarding the Palestinian-Israeli conflict is that it “should be resolved only through negotiations, based on UN Security Council Resolutions, the Madrid Principles, the Roadmap, the agreements previously reached by the parties and the Arab Peace Initiative.” Japan’s contributions to the process of achieving peace have been based on three pillars: 1) political dialogue with the parties concerned, 2) promoting confidence-building between Israelis and Palestinians, and 3) extending economic assistance to the Palestinians. On the diplomatic front, Tokyo has sought to conduct itself in a manner that demonstrates sensitivity and commitment to both sides’ needs and to an overall peaceful resolution of the Israeli-Palestinian conflict. Japan has traditionally voted in favor of UN General Assembly resolutions that support Palestinian rights but has assiduously refrained from publicly condemning Israel. However, it is economic development assistance and humanitarian aid that have long been the primary instruments that Japan has deployed to demonstrate its commitment to peace. Since the 1993 Oslo Accords, the Japanese government has provided more than $1.4 billion in grassroots development assistance to the Palestinian Authority (PA). Given that the peace process remains deadlocked, disbursing foreign aid to the PA is the only way which Japan and other countries can keep up the appearance of contributing to the easing of the long-standing conflict. When asked about the role of Japanese overseas development assistance (ODA), former Prime Minister Fayyad stated that such aid has been critically important to the PA’s functioning. When this concept is realized, the problems of this region will be solved not by the military forces or the politics, but at least through economic development. And I believe this can only be facilitated by Japan. Since the project’s inception, Tokyo and its partners have made some headway in bringing the JAIP to fruition. Together with the European Union (EU), Tokyo has helped fund the PA’s Partnership for Regional Investment, Development & Employment (PRIDE) program, which aims to assist eligible JAIP tenants in purchasing equipment, machinery, tools and building materials. 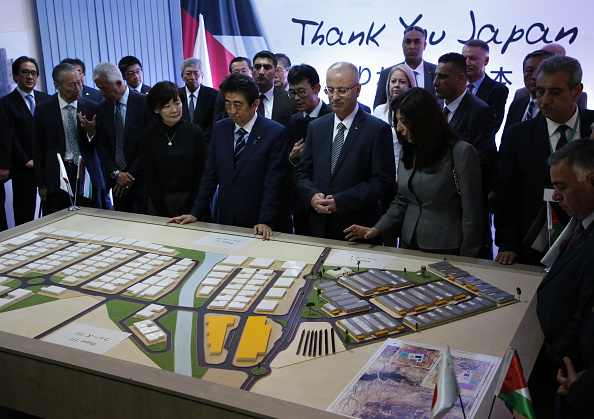 In August 17, for example, the Japanese government, together with the United Nations Development Program (UNDP), the Ministry of National Economy, the Palestinian Industrial Estates and Free Zones Authority (PIEFZA), and the Jericho Agro-Industrial Park Company (JAIP Co.) inaugurated 11 hangars earmarked for use by the Palestinian private sector for warehousing and production purposes. Nevertheless, progress has been slow-going. Only five planning meetings have been held involving all three parties to the project plus Jordan. The contract for the first (Palestinian) tenant company was not signed until July 2013. As previously mentioned, the Japanese government’s official goal in implementing the JAIP is to enhance the economic cooperation of the parties involved by permitting local farmers to establish their factories and farms to sell their products across the region. However, upon close examination, the agro-industrial zone has significant shortcomings. France, Turkey, and Germany too have built industrial zones in the West Bank. Yet, a major difference between them and JAIP is the latter’s isolated location in the Jordan Valley, which makes it difficult to access and thus for farmers to export their products. While it is not clear whether the road linking the highway to the JAIP is under construction or not, Japan’s MOFA published a report (available in Japanese only) which notes that the Palestinians living in the area have named the road “Tokyo Road” to show appreciation to the Japanese government and people. On the other hand, Japan’s Deputy Representative to the PA, Hideaki Yamamoto, has reported that negotiations with Israel about access to the project are still ongoing. On the grounds of security, Israel controls road access and any progress in that area will require the Israeli government’s approval. In the meantime, the project itself is surrounded by five major Israeli checkpoints that control who and what comes and goes in and out. This means that all goods produced in or entering the JAIP must pass through Israeli-controlled borders. According to the JAIP’s website, agricultural products exported from the park are labeled “Made in Palestine.” Whether true or not, this stamp can benefit Israeli investors and producers investing in the JAIP, since the label allows the products to enter many countries’ markets that boycott Israeli products. Another aspect that raises concern is the nature of investment in the project. According to the JAIP’s website, the investment environment is accessible to anyone and specifically to local farmers in the area. However, this is not necessarily the case. Investment as well as gaining approval to sell and manufacture agricultural products in the JAIP are costly and complicated. The application form requires an applicant (with local farmers being the targeted investors/participants) to agree to obtain electricity, water, and basic agricultural services from Israeli companies. In addition, the companies investing in the agro-industrial park are owned either by Israelis or by individuals associated with the PA, not by local farmers. For instance, one of the JAIP’s investors is Knesset member Noam Hilo, while another is Ahmed Attound, a member of the Palestinian Legislative Council. The farmers are allowed to apply to work as cheap labor and/or apply for a farming permit that can only be issued by the Israeli government. For the past several decades, successive Japanese administrations have worked to develop the tools and methods to play a more proactive diplomatic role in international affairs and thus promote the country’s interests and image abroad. Japan’s involvement in the Middle East has included efforts to find creative and constructive ways to address the Palestinian-Israeli conflict. In 2006, the Koizumi administration proposed the “Corridor for Peace and Prosperity” — an initiative aimed at helping Palestinians prepare for future statehood and thereby contributing to sustainable peace. This initiative paved the way for the launch of the Jericho Agricultural Industrial Park (JAIP). To be sure, progress in the development of the JAIP has been neither speedy nor smooth. In that sense, the JAIP has reflected, and indeed has been circumscribed by the complex politics of the conflict; it has not transformed it. At the same time, though, the JAIP has served Japan’s strategic objectives in enhancing its image and reputation as a constructive partner in the pursuit of peace and stability, and in maintaining close ties with all parties concerned both within and beyond the region. For the English text of Japan’s December 2013 National Security Strategy, see https://www.cas.go.jp/jp/siryou/131217anzenhoshou/nss-e.pdf. See, for example, Ministry of Foreign Affairs of Japan, “Japan’s Position on the Peace in the Middle East,” https://www.mofa.go.jp/region/middle_e/stance.html. Japan’s Ministry of Foreign Affairs (MOFA), mofa.go.jp/region/middle_e. Japan’s Ministry of Foreign Affairs (MOFA), Upper House Report and Survey of Japanese officials meeting with the PA (2012), Japanese version, mofa.go.jp/region/middle_e. Kansuke Nagaoka, “Views from the Far East on Middle East Peace,” Palestine - Israel Journal of Politics, Economics, and Culture 13, 4, (2007): 64-68. Japan Ministry of Foreign Affairs (MOFA), “Japan’s Concept for Creating the Corridor for Peace and Prosperity,” (Background Paper), https://www.mofa.go.jp/region/middle_e/palestine/concept0607.html. Japan’s Ministry of Foreign Affairs (MOFA), Statement by Foreign Minister Taro Asō on the Corridor for Peace and Prosperity 2007, mofa.go.jp/region/middle-e.
 Japan’s Ministry of Foreign Affairs (MOFA), “Japan’s Concept for Creating the Corridor for Peace and Prosperity” (Background Paper), https://www.mofa.go.jp/region/middle_e/palestine/concept0607.html. “Japan contributes financial aid to Jericho Agro Industrial Park project,” Palestinian News and Information Agency, December 19, 2017, http://english.wafa.ps/page.aspx?id=RqHd5ma95707329927aRqHd5m. Japan International Cooperation Agency (JICA), September 26, 2013, https://www.jica.go.jp/english/news/field/2013/130926_02.html. MOFA, Upper House Report and Survey of Japanese officials meeting with the PA (2012). Liz Ford, “Jericho Business Park Aims to Inch Palestine towards Sustainability, The Guardian, June 18, 2012, theguardian.com/global-development/2012/jun/18/jericho-business-park-palestine-sustainability. The Japan International Cooperation Agency’s development proposals for the Jordan Valley, Stop the Wall Campaign, November 2007 (in Arabic). Dawoud Hamza, “The Jericho Agricultural Industrial Park and Economic Impacts. Bisan Center for Research and Development (2012) (in Arabic). The Jericho Agricultural Industrial Park (JAIP), http://jaipark.com/#. Prisoner Support and Human Rights Association, Addameer, addameer.org/the_prisoners/plc_member.